Cytokinesis is the process by which cells divide from one to two. This process requires a machine that generates force to fission the cell exactly at its division site. In eukaryotic cells, i.e. like those in our body, this process requires a ring that encircles the cell containing key force-producing proteins such as actin and myosin, which also generate force in the muscle. Our group is investigating how this ring containing actin, myosin, and other proteins assembles and how it contracts. Our work will provide answers to fundamental questions as well as help understand complex diseases, cardiovascular disease. 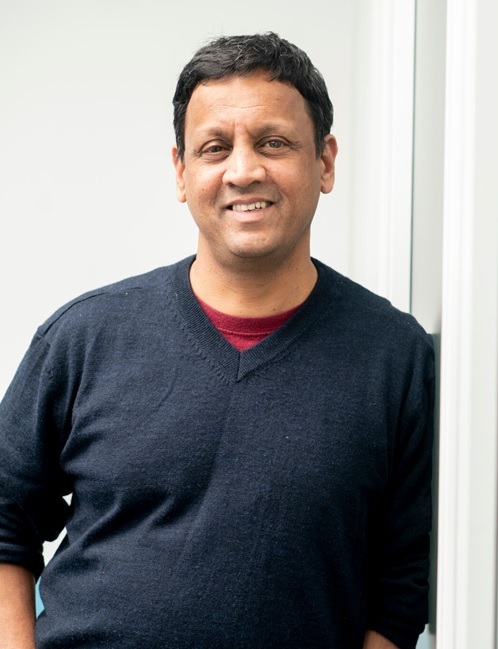 The Balasubramanian laboratory is interested in understanding molecular mechanisms regulating eukaryotic cytokinesis, a process that depends on an actomyosin-based contractile ring in many organisms. The group uses fission yeasts, Schizosaccharomyces pombe and Schizosaccharomyces japonicus as models, as they are amenable to the methods of genetics, biochemistry, and high-resolution imaging. Through genetic analysis, they have identified a large number of mutants defective in various stages of cytokinesis and identified the corresponding gene products, such as actin, myosin II, profilin, tropomyosin, and other proteins. They have also investigated the function of the proteins in actomyosin ring assembly and contraction through high-resolution microscopy. Recently, the group has developed a method to isolate contractile actomyosin rings that contract upon addition of ATP in vitro. Currently, the group is investigating these questions. 1. How is the actomyosin ring organized? The isolated rings are complex structures containing ~ 150 different proteins. The availability of isolated actomyosin rings presents an unprecedented opportunity to understand the structure of the cytokinetic actomyosin ring. Through the use of electron cryotomography the group will investigate the organization of the actomyosin ring and the possible location of important actomyosin ring proteins within the ring. specific chemical modifications using novel approaches such as genetic code expansion coupled with protein expression in cell lysates. 3. How does the ring contract to generate tension? The group is using the “isolated ring” system to understand the mechanism of ring contraction and is investigating the roles of various actomyosin ring components in generating tension. They take advantage of biophysical approaches and classical genetics to address these questions. 1. Tao, E.Y., Calvert M.E., and Balasubramanian M.K. (2014). Rewiring Mid1p independent Medial Division in Fission Yeast. Current Biology 18: 2181-2188. 2. Mishra, M.*, Kashiwazaki, J., Tagagi, T., Huang, Y. *, Srinivasan, R.*, Balasubramanian, M.K., and Mabuchi, I. (2013). "In Vitro Contraction of Cytokinetic Ring Depends on Myosin II but not on Actin Dynamics." Nature Cell Biology . 15: 853-859. * Authors from MKB laboratory underlined and MKB is a corresponding author. 3. Huang, J., Huang, Y., Yu, H., Padmanabhan, A., Subramanian, D., Tao, Y., Thadani, R., Tang, X., Wedlich-Soldner, R., and Balasubramanian, M.K. (2012) Non-medially assembled F-actin cables incorporate into the actomyosin ring in fission yeast. J Cell Biology 199: 831-847. 4. Calvert, M., Wright, G. D., Leong F.Y., Chiam, K.H., Chen, Y., Jedd, G., and Balasubramanian, M.K. (2011). Myosin II confers cell-size dependent scalability to the rate of actomyosin ring constriction. J Cell Biology. 195:799-813.